If you’re running a business, what really matters is probably your team’s and your own productivity. Surveys all around the world have proven that people waste quite a lot of time at work. Emails, meetings and administrative work being at the top of the list, however, are easy to solve. Keep reading how. How do work tasks waste time? 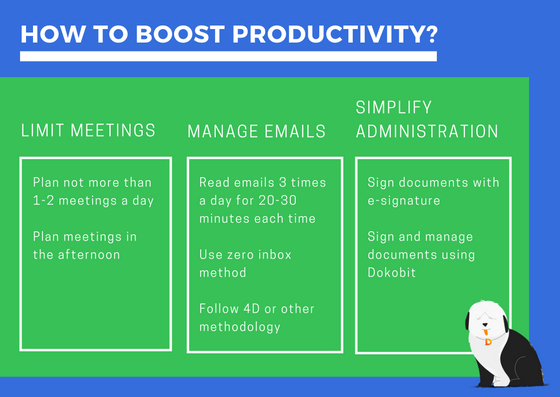 How from the first sight inevitable tasks like emails, meetings, and administrative work are a waste of time? It’s really simple. Meetings usually start late and have no strict agenda, thus a lot of side topics are being discussed. Besides, some meetings are organised with no reason or goal. Statistics also show that an average meeting attendee daydreams or does other work during the meetings most of the time (70-90%). Another problem is that there are a lot of excessive emails, especially among the colleagues when it’s much faster to discuss and agree on things eye to eye. Besides, people tend to check their inboxes too often and each time it takes around 15 minutes to refocus. Probably the easiest way to avoid such a time waste is to follow the examples of successful people — set exact time and period for email reading and meetings, e.g., plan max 2 meetings per day in the afternoon (this way there will be no time for unnecessary meetings) and read emails only three times a day limiting each time to 30 minutes and trying to get inbox to zero using 4D (Delete, Delegate, Defer, Do) or other methodology. This looks quite simple, but how about administrative work? Can it be a time waste? Well, have you ever wondered how much it costs to take care of paperwork the old-fashioned way a.k.a. preparing piles of documents and signing them by hand (and most likely you or your employees need to chase some people around to get the signatures), printing, scanning and sending them by mail or courier? Even reading it now, this seems to be quite a long and unreasonably complicated process. Years ago this probably was the only possible way so that’s why people did this, but today, with the 21st-century technologies in place, there’s really no point in frustrating yourself with such processes. Unfortunately, surveys show that more than 50% of companies still print documents solely for the reason of adding a signature. So what really happens when you sign documents by hand? To make it clearer, let’s talk numbers and detailed steps of a paper document signing process. Printing. In order for a document to be signed, it needs to be printed. So you find the document on your computer, open it, adjust printing settings and click print. Let’s say it takes max 5 minutes. Sorting. Once the documents are printed, you go to a printer (as it’s probably not on your table) and pick the documents up, maybe you need to sort them, to separate several copies, maybe clip them or add to a file. Let’s give this max 5 more minutes. Signing. If it’s not you who’s signing, you have to go search for the person you need to get a signature from (or your employee does). This part can be a bit challenging. The meetings can overlap, some unplanned things might come up and there are a million other reasons proving this step usually doesn’t happen in a minute. Of course, papers can be left on the signee’s table with a note but how often do people forget or don’t even notice such notes? Either way, some reminders follow, wasting two people’s time. The document is signed at some point. How long did it take? 20 minutes, 1 hour, 2 days? Too long. By the way, don’t forget that signing itself takes time as well — if it’s a 10-page document, you’ll have to put your signature on each page, on 2 or 3 copies! Scanning and emailing a copy. Once the document is signed, it’s usually scanned and emailed to another party which also needs to sign the document. Often, just to confirm that it’s been signed from your side and the original is already on its way. 5 more minutes? Well, if you write a longer email, it might take 10. Sending by mail or courier. If you have to deliver the original version of this signed document, you’ll probably send it out by mail or courier. This means you fold the document, add it in an envelope, write down an address, glue a postage stamp. Then you either go to a post office or call out a mailman or courier. Preparing document for sending it out probably takes you 10 minutes, plus the waiting time for a courier. And now imagine if your employees deliver documents physically or you organise a meeting just because you need to sign a document. How many hours travelling and getting stuck in a traffic jam does that take? Waiting for other parties’ signatures. And now you wait. The document at best reaches the other party in a day. They go through the same process you did. The whole document’s journey starting from you sending it out and ending back in your hands probably takes 3-4 days or longer. That’s about right. And we’re not even talking here about getting documents lost somewhere in the process, spotting mistakes that require to repeat the whole process all over again, or later searching for specific documents in large archives. Now, what’s your option? There’s a proven solution called signing documents with e-signature, using Dokobit! Let’s talk details once more. Logging in. To sign an e-document, you only need to open a browser, type www.dokobit.com, authenticate yourself with a chosen solution and here you are. Uploading a document. Just click an Upload a document button and add a document you need to sign. Sending. Add addressees, set signing deadline. The document to other signing parties is sent right away. Signing. Once a document is uploaded, by clicking Sign button you can choose a tool to sign: m-signature, eID, USB or Smart-ID, and confirm the signing action entering a PIN code. Yes, it’s that simple. And you shouldn’t just take our word for it, you should try it yourself! Signing a document using Dokobit takes max 5 minutes. Other parties will get notifications to their emails and will be able to log in right away to sign your document. In case a person forgets to sign but you’ve set a signing deadline, they will get a reminder. So as you can see, it not only saves your time and makes the document signing process more efficient, it also saves money that you spend on paper, printing, and mailing. How much? Approximately 7 euros per document. This includes cost on workforce of around 4 euros, printing cost of around 1 euro and postage cost of around 2 euros. An additional bonus is that you will also be able to easily manage documents – they’ll all be in one place and it’ll be easy to find them through search or according to the categories you assign your documents to, this way documents have no way of being lost. Now, as you see a clear difference, are you ready to switch from regular handwritten to electronic signature and run your business paperless? Try it out now for free and upgrade whenever according to your needs! Find what’s right for you and calculate your potential savings here. Plan as few meetings as possible. Plan 1-2 meetings per day, best in the afternoon. This way you won’t have time for unnecessary meetings, you will filter them more carefully. Set agenda for email reading and use 4D methodology. It’s best to read emails 3 times a day and limit each session to the minimum time, 20-30 minutes. When reading emails, try to follow zero inbox rule combining it with 4D — Delete, Delegate, Defer, Do — methodology. The goal is to go through all the emails and either delete them, delegate to others, defer if not urgent and reply to those that are. This way your inbox will always be clean and you won’t have to read the same emails several times. Switch to paperless processes. Sign documents using electronic signature via e-document signing portal Dokobit. This way you can save at least 25 minutes per one document, plus expenses on paper, printing and sending.